Kale & sausage are a delightfully delicious match! Looking for a delicious holiday appetizer? 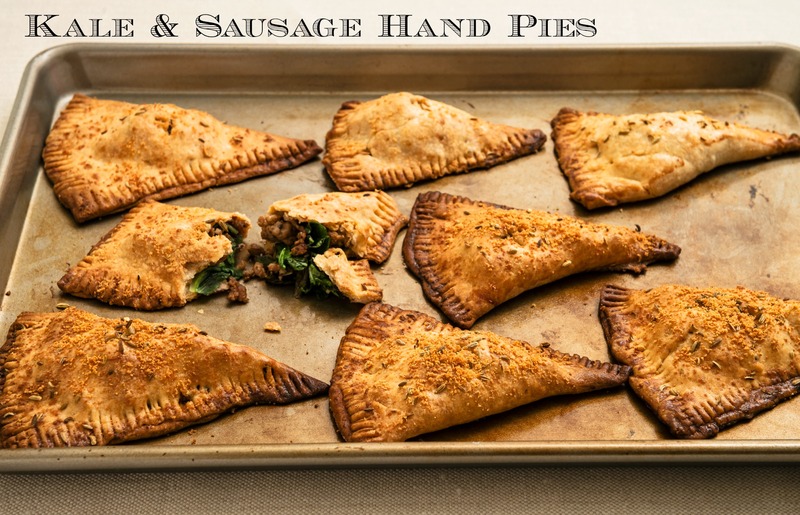 Try these Kale and Sausage Hand Pies, adopted from Josie’s Organics! Kale and sausage pair wonderfully together, especially kale and Italian sausage. Like to spice things up a bit? go for hot Italian sausage. For the kale, feel free to use either green or red. You can make your pie crust from scratch, of course, but we opted for pre-made pie dough from the dairy case to keep things super easy. Heat olive oil on medium-high in a medium sauté pan. Add sausage and brown, breaking it up into small pieces, about 5-7 minutes. Add onion and cook an additional 5 minutes until it softens. Stir in 1 teaspoon fennel seeds and the paprika to release their flavors. Fold in kale and cook until wilted, about 3-4 minutes. Season with salt and pepper. Set aside and let cool. Remove pie crusts from package and unroll them onto a lightly floured cutting board. Using a paring knife, divide them into quarters. Place a heaping Tablespoonful of the sausage-kale mixture on the right side of each quartered crust, leaving about ½-inch border. With a pastry brush, lightly wash the crust edges with egg. Fold the left side of the crust over the mixture, bringing the edges together. Seal with the tines of a fork. Brush the tops of each hand pie with the remaining egg wash. Cut small slits in the top of each pie to vent steam. Sprinkle with Romano cheese and remaining fennel seeds. Place on a large baking sheet lined with parchment paper. Bake for 20-25 minutes until golden brown. Let cool 10-15 minutes on a wire baking rack. Serve warm or room temperature. If you are a fan of cheese, add small pieces of mozzarella or Monterey Jack before you seal the pies. The pies are great for parties, too. For a more elegant hors d’oeurve, use a 3-inch cookie cutter for the crusts. Lutein and zeaxanthin, nutrients that give kale its deep, dark green coloring and protect against macular degeneration and cataracts. Minerals including phosphorus, potassium, calcium, and zinc. Now that you know how good kale is for you, try these Kale and Sausage Hand Pies and learn how good kale can taste! What’s your favorite way to serve kale? Let us know in the comments below.